With 30 years of combined experience, the attorneys at our Salt Lake City personal injury law firm, Handy & Handy, focus their practices on accident and injury cases in Utah. Attorneys Garrett S. Handy and Preston L. Handy have obtained in excess of $100 million for our clients in personal injury cases involving car accidents, claims for wrongful death, product liability cases, slip and falls, and dog bites. Additionally, we offer legal assistance to those who are suffering after accidents involving motorcycles, trucks and commercial vehicles. Both of our law firm's attorneys received their undergraduate degrees from The University of Utah. Preston Handy went on to earn his Juris Doctor from The University of Utah S.J. Quinney College of Law, while Garrett Handy earned his Juris Doctor from Wake Forest University School of Law. In the years since beginning their legal careers in Utah, they have earned much recognition for their abilities. In fact, Utah Business magazine listed both of our attorneys among the state's Legal Elite. Prior to establishing our law firm, Garrett and Preston both worked for large personal injury law firms in the Salt Lake City area. 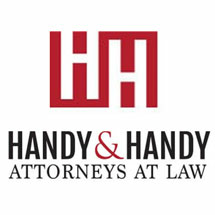 After gaining hands-on experience by handling hundreds of personal injury cases, they founded Handy & Handy with the goal of providing Utah residents with high-quality, personalized legal services. If you would like to learn more about our firm's services, you can take advantage of a free initial consultation.